The U.S. Bureau of Mines conducted research to reduce musculoskeletal injuries. Occupationally related musculoskeletal injuries pose a significant problem to the mining industry. Ergonomics can help to reduce the costs associated with these injuries. Mines can institute committees to solve ergonomic problems. These committees should include representatives from management, the labor force, and the medical department. 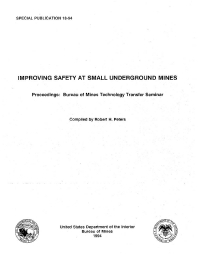 Various analysis techniques, such as job safety analysis, task analyses, materials-handling flowcharts, and preliminary hazards analysis can be used to identify ergonomic problems in and around a mine. Once hazards have been identified, then solutions can be formulated and implemented. The preferred strategy is to redesign the job by eliminating the hazard, removing the worker from exposure, or mechanizing the task. If these strategies are infeasible, then the job should be designed so that it can be performed within the workers' capabilities. After any ergonomic solution is implemented, a followup analysis should be performed to ensure the effectiveness of the change and to guard against the introduction of any new ergonomic or safety hazards. Physical fitness programs and training can be used to supplement job redesign. By effectively instituting sound ergonomic implementation strategies, the costs associated with musculoskeletal disorders can be reduced.